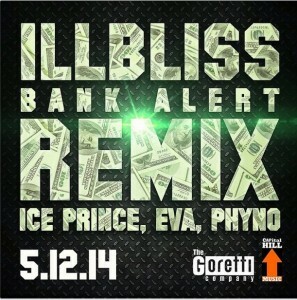 The All star Remix to iLLBLISS’s Rap banger ‘Bank Alerts’ is here!!!! featuring three hip hop heavyweights IcePrince Zamani, Eva Alordiah and Phyno! This has to be the dopest rap collaboration this year. Sit tight and hit the play button cos you about to get blown away!! Unarguably one of the biggest rap joints of 2014,the original solo version of Bank Alerts was released in September 2014 and blew up tremendously on various radio platforms across Nigeria. Download and share this new jamz to ur friend on any social network and remember to drop your comments.